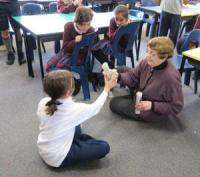 Pauline used to be a student at Holy Cross School from 1942 to 1948. She came to Room 8 to talk to us about her school years. She answered a lot of our questions. In 1942 World War 2 was going on at the same time that she was at school so, there were air raid shelters built in the school by the netball courts. Pauline said there was a siren to warn them that there was a practice. We think the air raid drills were a bit like the earthquake drills we have today. Air Raid Shelter foundations and walls can still be seen today. The Sisters were teachers at the school. They wore habits and Pauline said they were fair and kind. The habits were very heavy, long and hot to wear in the summertime. They made it hard for the Sisters to ride bikes, so they walked everywhere. Pauline used a slate and pencil for all of her school work. She loved to play netball which is a bit like basketball and netball that we play today. The children also learned to play with the titorea sticks and she got to play them with children in Room 8 when she visited. Children had responsibility for tidying up the classrooms, hallways, and even the toilets. That’s different to what happens these days.